Ms. Wipf is a 2010 graduate of the University of California, Berkeley. She received a Bachelor of Arts in Environmental Economics and Policy and a minor in City Planning. She received her law (J.D.) degree from the University of San Francisco in 2014. Ms. Wipf was admitted to practice before all courts of the State of California and the United States District Court for the Northern District of California in 2014. Ms. Wipf’s practice consists of transactional work and litigation, with an emphasis in estate planning, real property issues, and representing landlords in unlawful detainer matters. 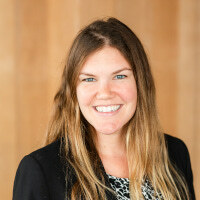 Ms. Wipf was born and raised in Ukiah and returned to her hometown to practice law.